Tim Hart writes, “Wednesday the 23rd of May saw two regional qualifying events take place in the ScotRail National Primary Schools Cup. At Bothwell Castle Policies (Uddingston CC), pictured below, left, St. John the Baptist Primary School won the Lanarkshire Qualifying Event. Tim Hart writes, “Tuesday the 15th of May saw Cambusdoon (Ayr CC) host the Ayrshire qualifying tournament in the Cricket Factory BIG Blast! The inaugural Ayrshire event saw 86 pupils, from five schools, come together to compete in an eleven-team competition. There was a round-robin phase, followed by one round of placement matches. 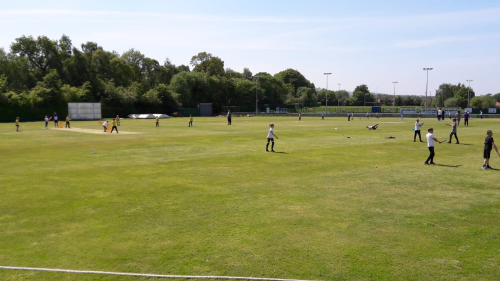 In total, 30 modified format matches took place on a glorious summer day! The final saw the two group stage winners (who had both come through the group stage undefeated) compete to see who would go on to represent Ayrshire in next week’s west regional qualifying competition. It was a team from Belmont Academy who prevailed over a team from Kyle Academy – with the margin of victory being just 11 runs. Cricket Scotland Regional Participation Manager West, Tim Hart, has forwarded on information in connection with competitions and events, being organised by the national governing body, for schools in 2018. This can be found online here. 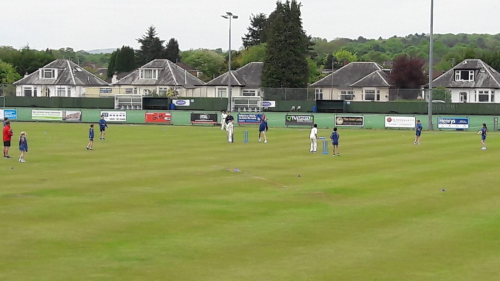 Tim Hart reports, “The final of the west regional qualifying section in the Cricket Scotland National Secondary Schools Cup finally took place on Tuesday 13 June, in Perth. As a result of logistical challenges in one of the other regional qualifying sections, both Hutchesons’ Grammar School and The Glasgow Academy were invited to take part in the National Finals Day, at Doo’Cot Park. Unfortunately, both schools were defeated in their semi-final matches – but it did mean that they met each other in the third/fourth place play-off, with the match also doubling up as the west regional section final. “The match saw Hutchesons’ Grammar School record a 64-run win, thanks to Struan Walker (Clydesdale CC) playing a starring role. Batting at number four, he scored a superb 111 not out (an innings which included just the eleven boundaries) out of the Hutchesons’ Grammar School’s total of 168 for 4. In reply, 43 from Jack McCamley-Wilding (Glasgow Accies CC) kept The Glasgow Academy up with the required rate during the early part of their innings. However, the pressure to keep that scoring rate up proved to be too much, as the reply finished on 104 for 7.